If you are not getting enough sleep, then you might want to consider changing your décor. What you need in order to get a good night’s sleep is a relaxing atmosphere and not a room filled with unnecessary items and strong colors. Take a look and learn how to turn your bedroom into a sanctuary and finally get some rest. Your #bedroom needs to be clean and completely clutter-free if you want to feel relaxed and serene every time you walk into it. Even your collection of stuffed toys can make your #bedroom look crammed, so make sure that there are only necessities and a just few items that create a restful atmosphere. Soft lighting, such as candles, will help you rest your eyes and relax even before you actually fall asleep. Calming scents can also help you unwind after a long day; when your pillow and bedding smell like lavender, it will be much easier for you to rest and feel energetic the following day. 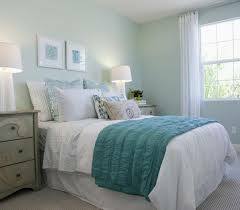 Beautiful and comfortable bedding is also very important for a bedroom that looks and feels like a sanctuary. There is nothing that can make you feel relaxed more quickly than a comfortable bed so take some time to find quality natural fibre sheets in calming colors of the season.